In three previous posts (one, two, and three), readers offered suggestions as to what color I should paint the library in the Cross House. I love this input! The room will mostly be bookshelves from floor to ceiling, so the color will be confined, in the main, to the ceiling and around the windows. I have been pondering/lusting blue. Tiffany Blue, to be specific. But is this the mosteverfabulous shade of blue for the library? The zillion books on the shelves will of course have spines in every color, so the room could be painted any color, save for my entrenched/annoying blue fixation. One important consideration however is the stained-glass windows. I do want the blue to complement the glass. Tiffany Blue in virtual reality. Thanks Kelly!!!!!!!! When I look at the above image, my great love affair with Tiffany sorta peters out. 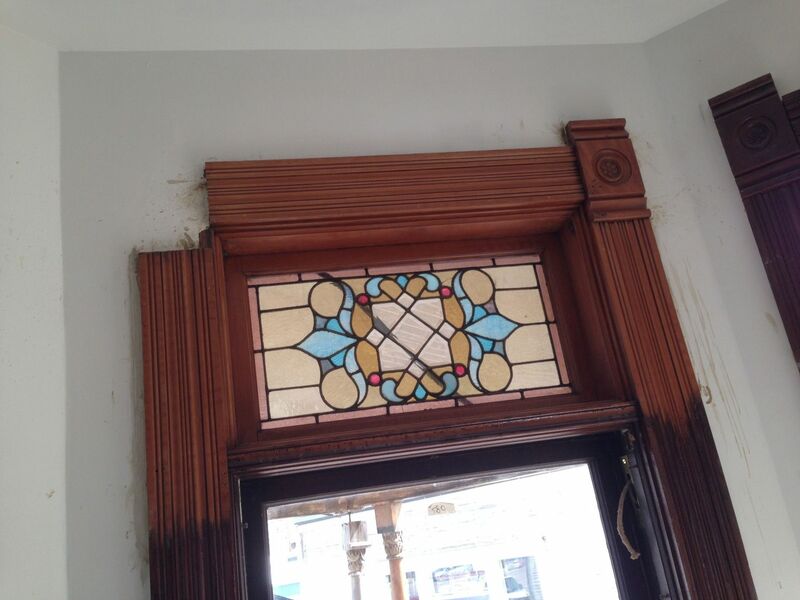 However, the DARK wood trim will not look like this when the original finish is restored. 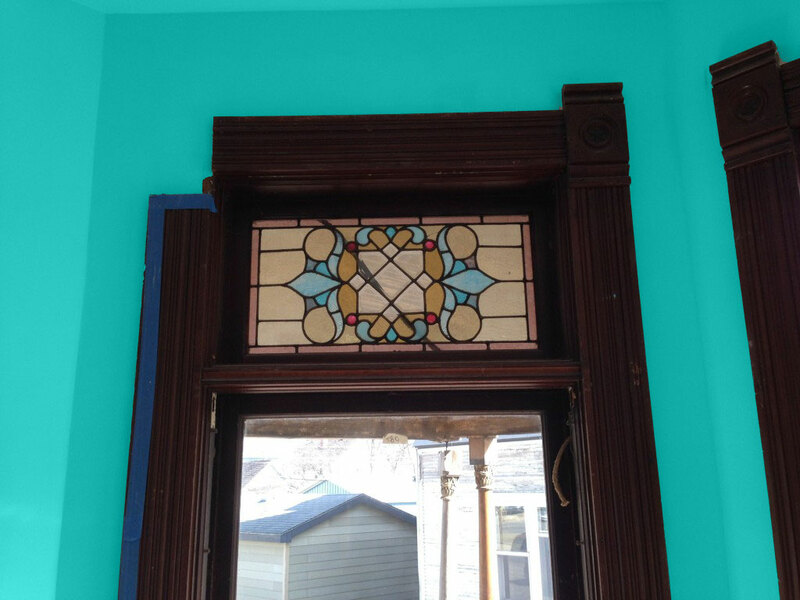 It has taken awhile, but I now offer for your consideration the same window with the — drum roll, please —original faux painted finish revealed. Whoee! The original finish revealed. Incredible. A faux cherry. Oh, I have the missing corner block. You can appreciate how much lighter the trim is. Thanks Grace!!!!!!! I do not know how to photoshop but it seems that a lot of people do. So, I was crossing my fingers that some readers might be willing to forward their photoshopped suggestions. I will post all the images received. NOTE: I am looking for a strong, intense color. Nothing safe. Nothing demure. The Cross House can handle it. NOTE: I will be buying the paint from Sherwin-Williams. Give me colour suggestions and I’ll paint the walls. Great work Melody! But, is the ceiling going to be white or color? It will make a difference in the image which currently shows a blue ceiling. I’m also wondering if the ceiling will be white/cream or Tiffany blue — because it will make a big difference in the finished look of the room. The walls and ceiling will be the same color. Hmm, I did a crude crooked house style MS Paint job to your photo and e-mailed it to you and then saw that someone already photoshopped it. I can use Photoshop but I’m too cheap to pay for it. And actually, at the rate I’m going my cheapness may be needed. I think the medium wood tone holds up great against the bright blue and actually it’s not far off from a mid century color combo. If you really want to match the stained glass you may want to go less green. I may drop in there this weekend and I’ll see if anything sticks out. Actually I saw that other comment with the blue matched to the stained glass and I think it’s too cold. The Tiffany blue is better.